A better way to search and load BIM content, GAMUT|USER(PRO) lets you access all the content in your library as well as participating web content libraries; all without leaving Revit, advertisement free. Search, configure and load, all in a single step. We use unobtrusive advertising to keep GAMUT|USER free, so if you don’t want advertisements to show up in your searches, Gamut|User(Pro) is a small price to pay. 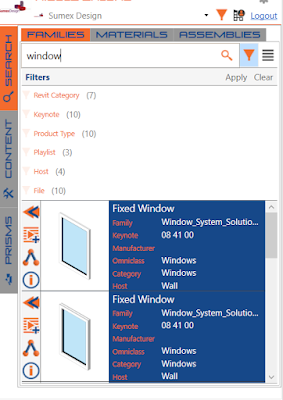 Search through multiple libraries – Local, network and web library locations can be set up and customized to instantly load families, walls, floors, ceilings, roofs, and even materials. Preview the data and graphics – Ensure that the content you load is the content you want. Configure content before loading into the project – Load only the necessary family types, parameters, and materials to keep your project browser clean and file size small. Load everything for your project – Deploy family types, materials, and assemblies simultaneously. No Advertisements – the Pro version is free of ads in your search results. GAMUT|USER(PRO) is brought to you by SPECtrumBIM. It's priced at US $4.00/month or $40.00/year.